In-Situ Hybridization is a type of hybridization to localize a specific DNA or RNA sequence in a portion or section of tissue, in cells, and in circulating tumor cells (CTCs). It uses a labelled complementary DNA, RNA or modified nucleic acids strand to reveal the location of specific nucleic acid sequences on chromosomes or in tissues. 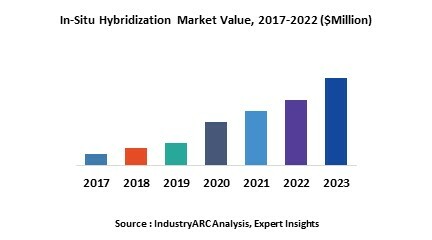 Globally, rising awareness of the use of in situ hybridization, growing healthcare expenditure levels, increasing prevalence of cancer, and growing usage in research activities & laboratories to diagnose cancer, chromosomal abnormalities, and infectious diseases are the prime growth drivers of global In-Situ Hybridization market. In addition, development of technologies to create high value in-situ hybridization and increase in adoption of in-situ hybridization in emerging economies such as China, India and others, will create new opportunities for global in-situ hybridization market. However, higher cost of the research and development, and stringent government regulations and approval process are the key restraints for in-situ hybridization market. Geographically North America dominated in-situ hybridization market owing to rising incidences of and diagnosis of cancer in the U.S. and Canada, increasing clinical research in cancer by biotechnology and pharmaceutical companies, government initiatives, and rising usage of companion diagnostics. In terms of growth, Asia Pacific is projected to have fastest growth. Some of the major factors responsible are rapidly growing presence of international players in China and India, increasing cancer prevalence and diagnosis, and increased healthcare expenditure, growing medical tourism, and favourable government policies in developing nations such as China, and India in this region. Among all the application, cancer diagnosis has the highest market share in global in-situ hybridization market. This report identifies the in-situ hybridization market size in for the year 2015-2017, and forecast of the same for year 2025. It also highlights the market drivers, restraints, growth indicators, challenges, and other key aspects with respect to global in-situ hybridization market.